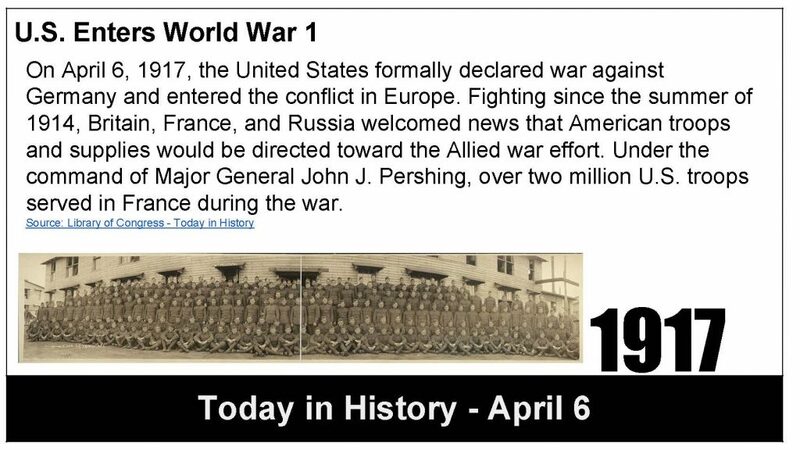 Today is the 100-year anniversary of the United States Congress’s Declaration of War on Germany. Only Congress can declare war, but the president must request the Congress to declare war before a joint session of both the Senate and the House of Representatives. President Wilson had come before Congress only days before and asked Congress to declare war on April 2 and four days later the United States House of Representatives voted 373-50 in favor and the United States Senate followed with a vote of 82-6. And, then the United States joined the Allies against Germany. My history classes and I have been studying the years leading up to World War I and we are finishing reading President Wilson’s War Message speech. It’s over 3500 words long and I have divided it into small manageable parts for my 8th graders. But it is not an easy read. But, the United States was late in coming to the war. The war had begun in July 1914 after a combination of militarism, a system of alliances, imperialism, and a budding nationalism was set afire by a spark – the assassination of Arch Franz Ferdinand of Austria-Hungary. When the war began, the United States declared itself neutral, but we weren’t. We were allied with the British and the French and against Germany. We sold war material to anyone who could buy it, but mostly we traded with the British and the Allies. The Germans countered with their U-boats and began sinking British merchant vessels as they approached the British Isles. In May 1915, a German U-boat sank the passenger liner RMS Lusitania and killed 1198 passengers and President Wilson protested. 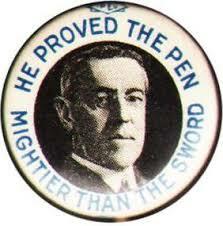 The Lusitania sinking turned world opinion against Germany, but the United States did not enter the war. Meanwhile, the United States remained neutral, and continued trading with the Allies – war material and food. 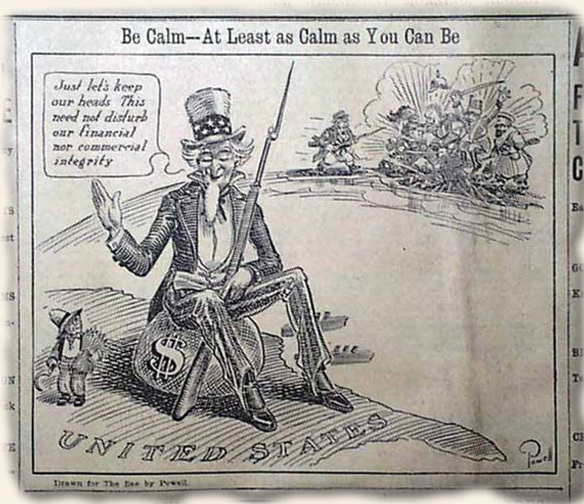 In 1916, President Wilson campaigned for president with the slogan, “He Kept us out of the War.” However, by the time 1917 arrived, the United States could no longer stand aside and remain neutral. Germany was desperate and had resumed unrestricted submarine warfare but the final straw was the interception of the Zimmerman Telegram in which Germany proposed an alliance with Mexico promising the return of territory taken from Mexico in the mid-nineteenth century. Public sentiment was for war and on April 2, Wilson addressed Congress and asked for a formal declaration of war against Germany. It was a dumb war. I suppose all wars are dumb, but this war created more problems than it solved. Historians estimate that somewhere between 17 million and 20 million people died during the war. 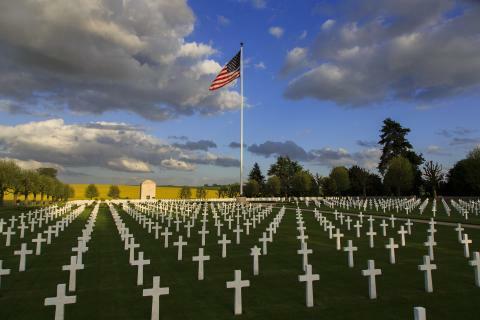 The United States would lose 117,000 men and women in the war, the United Kingdom almost a million, and France a bit more than a million. But most importantly Europe would lose a generation of young men and stumble into another war in another two decades. It was a dumb war, most wars are. If only we could have listened, if only we could have been heard. Perhaps reason might have prevailed. Today is going to be a great day. It’s Thursday and 100 years later, but seemingly there is more of the same in the world today. We all want to be free, we all want self-determination, but perhaps reason might prevail. Making the Days Count, one day at a time, one lesson for my 8th graders, and one history lesson for me. May the leaders of the world open their ears to listen. Peace.